It’s a question a number of characters ask throughout 308, about a number of different things. But the probing, dangling question seems to always be cutting into the same root, planted years and years ago: Alison and Cole. It’s an about face, to be sure. And though Alison is delighted at having her daughter back she understands Cole was thrown by it all happening so fast. He and Luisa seemed to be having a tense talk after the hearing, after all. Alison brings him coffee and a muffin at his in-progress house, and he says that it “seems a little fast” to him. “You haven’t exactly been the model of consistency since you got back; you’re still you,” he throws in her face before asking her to leave. After that she goes to see Cole and tell her she’s been invited to a program at Woodlawn. Cole doesn’t take this well, but really, did we expect him to? He’s been in such a foul mood all episode, even as he tries to be friends with Alison. You can feel him pushing her away even as he draws her closer, talking about the film of grief over her eyes. Cole can’t stand it; he accuses Alison of only thinking about herself—a fair critique, when she says she hasn’t thought about how Joanie would factor into her plan to live in New Jersey half the week, less fair when he says he “knew she was going to do something like this.” She says she brought him this news because he’s the only one who can understand, and he waves her off. She heads to bar where she runs into…Helen. 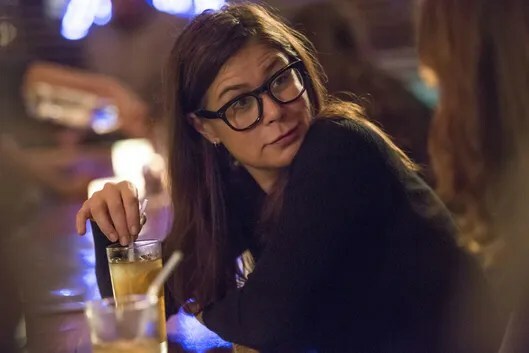 It’s their first real heart-to-heart, and they both get somethings off their chests: Helen continues to wrestle with who Noah was not only to her but with her, and Alison apologizes for the affair. It’s a weird day for her, to be sure. Even weirder when a cop friend tips her off that the New Jersey cops are back questioning Cole after he popped up on toll cameras close to Noah’s house the night of the attack. And then we’re with Cole, back at his courthouse chat with Luisa post-testimony. His memory of it all looks a lot less contentious than Alison’s memory of it all, but it’s just the beginning of a bad day after the new powers that be want him to halt progress on his house due to code violations. When he comes home, weary of the ways of the world and utterly exhausted, Luisa asks him if they’re ready to start their own family. He shrugs it off, saying he’s interested but he’d like to talk about it at a later time. Next day: Still hasn’t halted production on the house. Oscar gets sent from town council to tell him to cut it out, because he’s a high-profile citizen and they want to make an example of him. Eventually their conversation turns to a heart-to-heart, about love, parenting, and Alison. Oscar warns him that she’s not worth leaving Luisa for, but Cole still seems troubled by the thought of it. And that’s why he can’t handle when she comes by. In his version of events she doesn’t just leisurely pull over after seeing him at the Lobster Roll, she barges into the restaurant as he’s getting set up (and likely mentally lingering on his conversation with Oscar). She’s much more clear about spending more time away from Montauk, and he can’t handle it. “As long as I’m crazy you get to be sane,” she zings back at him. It’s enough to send him back to Luisa, almost manic about the possibility of starting a family. She’s thrown, trying to appeal for him to table it until he calms down when the cops show up. They’re itching to nab him for anything they can, it seems, and when he waves his hand too close to them they grab him and take him to jail for the night. And Alison visits him. She asks him what he was doing down in New Jersey that night. He admits that he drove to see Dr. Perry because seeing her up in Montauk, being good with Joanie, being clearer, gave him ideas. And they have one of the clearest conversations we’ve ever seen from them. A: Why did you need to see my doctor? C: I needed her professional opinion I guess. About how you are…I don’t need you, I don’t want you, I don’t miss you. Truth is I do. I need you. And I want you, and I miss you, and I love you. And i’m tired of pretending that I don’t. A: I’m depressed with mood swings…I know that i am not an easy person to love. I love you. I always have and I always will. But this is your decision to make. And I don’t envy you. When Cole gets released from jail Luisa asks him what he told them. “The truth,” he says; he drove down to see her doctor to get evidence for the custody case. Luisa doesn’t believe him, but when he rolls over to go to sleep she doesn’t push him either. A: We keep coming back to each other. A: Don’t you think that means something? A: And now…we are? You’re scared. I think you’re giving up because we’ve made a mess of everything and it’s too complicated. If you leave Luisa now you can’t play the good guy anymore. But either way, the next morning he’s in the kitchen, making up with Luisa. His face is a bit inscrutable, but it seems there’s more to be resolved here too. It’s not really clear at what point this takes place. We know that it’s been a couple weeks since we last saw Cole and Alison, since they talked about the court date, but how long has Noah been staying with Helen? Why did she lie about Vick treating him? The fact that Luisa told Joanie about the court decision all alone is so indicative of her place in Joanie’s life; like that’s not even co-parenting. She’s just being a primary parent, which wouldn’t be where you’d think she is. Oscar is so chill with his “She’s a solid B+ and, let’s face it, I’m a C” that I CAN’T STOP thinking he’s on to something. I am far from an expert on these sorts of things, but it really feels like The Affair has gone off some sort of predetermined or mapped out plan for its plot. It kind of fits like a cheap sweater, loose in the wrong areas but so right where it’s right. But it’s officially been renewed for a fourth season, so I guess there’s more drama planned for our crew.